In Greek myths and in Shakespeare, lead characters often suffer from hubris. Hubris is the character’s arrogance that leads to their ultimate demise. I frame last Thursday’s race in that context for a reason. It will be revealed from behind this curtain at the end. Hold tight. 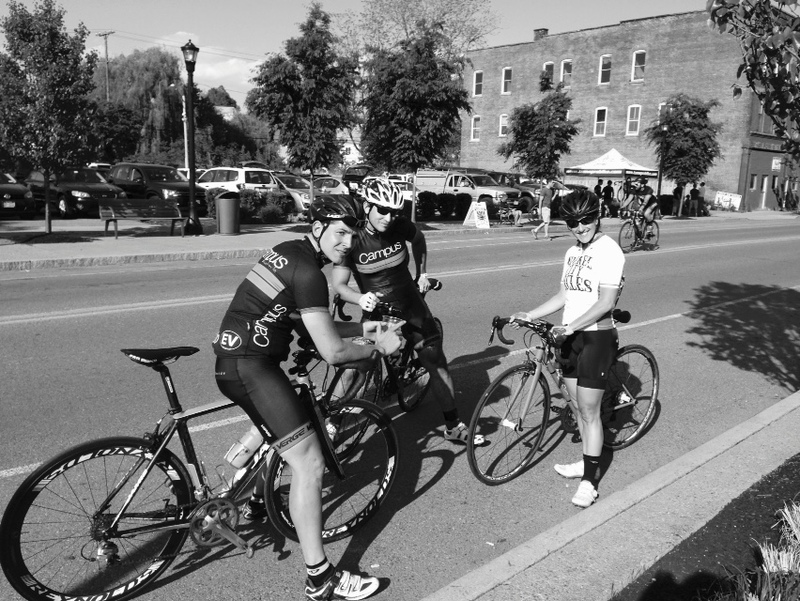 The first race of the Larkin Crit series that I did was fun. However, a familiar voice came up from behind me while I was racing. And that’s when I didn’t quite know what to do. Racing last year has always been me alone. I never am able to hold on to anyone’s wheel. I stay on at the beginning and then I am left in the emptiness of the race. I am solo. However, this voice, was asking me to ride with her, to work together. This voice belonged to my friend, from the other team. The team I was trying to beat. The team I was having a hard time beating. This voice belonged to the woman who when I first got into cycling told me about yoga and meditation. 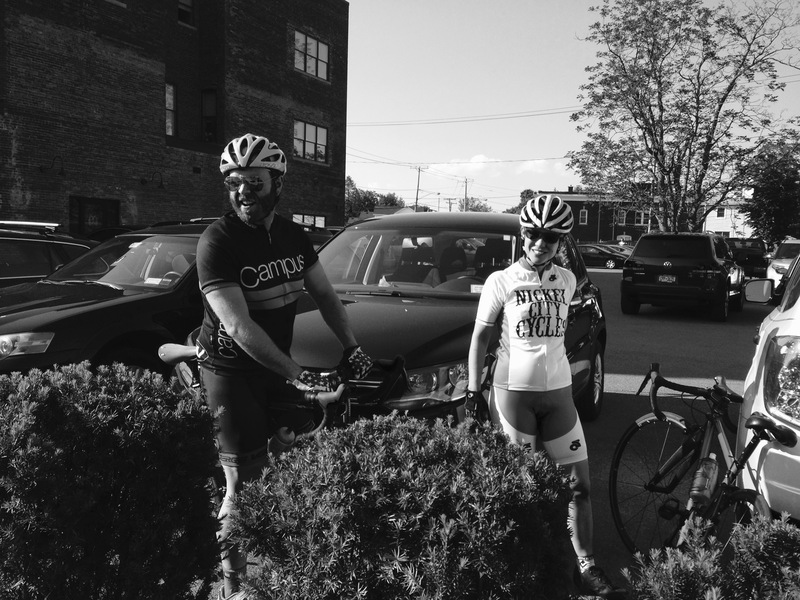 We talked for an entire group ride about meditation and yoga. It was lovely. I love meditation. However, I started to work together with her. We alternated taking each other’s wheel. I, then sprinted to the finish, in front of her, not realizing that I was ahead of the leaders (after they had lapped me numerous times) and so I crossed the finish line before the race was ended, thus putting me on the score chart behind the voice. The second race that I did, I had a different strategy: stay far away from the voice. Go solo. My ego created this plan. She thought we could do it. She thought, “We don’t need anyone! We are amazing! We might win this thing!” It should be noted when I say “win,” I mean, come in fourteenth–which would be winning for me. So, I go pretty fast in the beginning. I’m holding at twenty miles per hour (at one point, twenty-three! ), but then I loose the pack. I loose the wheel and I am mentally defeated. And from behind me comes the voice. This is where I want to tell you that I am a humble person. This is where I want to tell you that I am this incredibly sensible person who would of course then take that wheel. However, what do I do? I take her wheel for a lap and a half and then I try to lose her. I try to shake her off. But, I. Am. Working. On. It. Therefore, she amazingly, offers me her wheel again and I try to grab it but then the leaders come up and we all have to move to the right and it’s jumbled and I’m passing someone who came to her first race and I lose the wheel. And, passing this person makes me feel encouraged. It makes me feel hopeful. It makes me feel like I am in a 5k and I love 5ks. I love them because more people do them. There are people both slightly better and slightly worse than me. Instead of in this sport, where mostly everyone is just completely better than I am. Except, the voice. She is just a bit better than I am. And, it is then, that I realize, I have been given a gift. I end the race. I do terribly. This is no surprise. However, I have a good time and I get a glass of wine and it tastes amazing. Wine tastes amazing after bike riding. My friend from the other team comes up to me. And, I do get it. I get that when life gives you someone like this, some lovely person who is racing because she wants to learn, just like me, then that is the time when you work together. This is true not just for bike racing, but for life. We aren’t opponents with each other. We are there to support one another. It is not a competition of who buys a house or gets a high paying job or whatever societal coinage you want to compare. It is not about these things. It is about appreciating each other and seeing one another as gifts. I see this lovely woman as a gift in my racing world. For me, I have found one other person who can help me and I can help her and race with her. Race against her. Draft off her and then she can draft of me. We can race in the best sense of the word. We can still sprint at the end. We can still use technique, but we can help each other. I was given a gift to help me be less arrogant–to prevent my hubristic nature. And, maybe this is why I continue this sport. I could be doing things I am better at, but I choose to do this because it is so rich with value for me. There is tremendous value in defeat. There is so much to learn from this woman, this sport, myself in this context. And we start tonight. Our own practice: intervals and probably some talk about meditation. 4pm. She and I.
I just read this. You so got this spiritual thing. I can’t put words down, because I can’t think. I am humbled by your words. I hate this picture of me, but it doesn’t matter. I have been struggling with how I feel about the whole cycling team and had a bit of a high learning curve, but I came to a peaceful place around it and now this. This means so much. Thank you for being in my life as a friend and a follow cyclist. See you tonight.